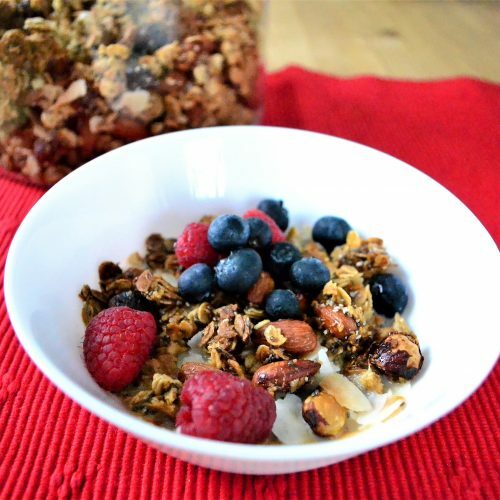 This is basic, very easy to make, oat crunch granola with lots of healthy nuts and seeds. The recipe is easily adjustable and I like to change it sometimes to include coconut flakes instead of seeds or use different type of nuts. I don’t like adding dried fruit to my granola because it burns fast and needs to be added at the end, or mixed regularly. I’m too lazy busy for that and prefer to spread granola on the sheet pan and forget about it until my timer rings. But when I did go through the trouble of mixing it half way through cooking, I found that dried apricots and figs work great here. Serve with milk or Greek yogurt for more crunch. I like mine with organic oat milk. Add dried or fresh fruit for an energizing breakfast or a snack. 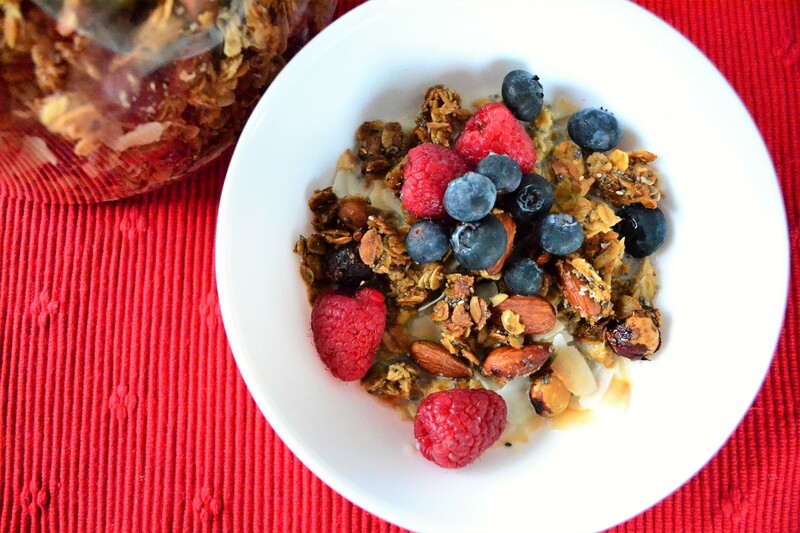 Easy basic granola with oats, nuts and seeds. Perfect with Greek yogurt for a quick, healthy and energizing breakfast. Preheat the oven to 150C and line shallow baking tray with baking parchment. 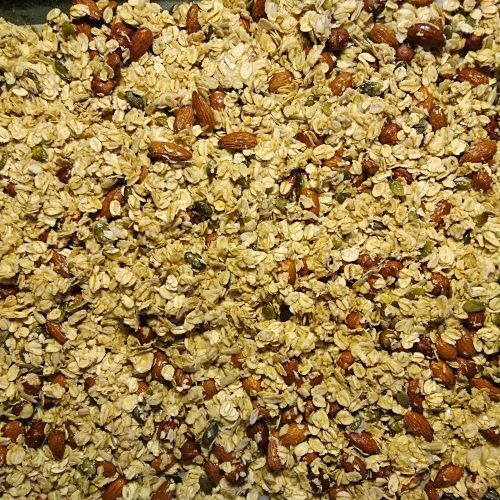 Mix oats, nuts and seeds in a bowl, then add all of the rest ingredients and mix thoroughly so everything is evenly coated. Spread the mixture in a thin layer on the baking tray and bake for 30 mins. Check half way through. If any of the nuts are too brown, turn the granola. It should be golden, honey colour when ready. Remove from the oven and leave to cool and crisp. Once completely cool, break it up and place in a sealed container. Granola should keep for about two weeks, but it never lasts that long in my household, so I haven't been able to check this theory. *if using coconut chips, add them for the last 5 minutes of cooking.